Whenever news reports on TV and radio would mention the G.V. 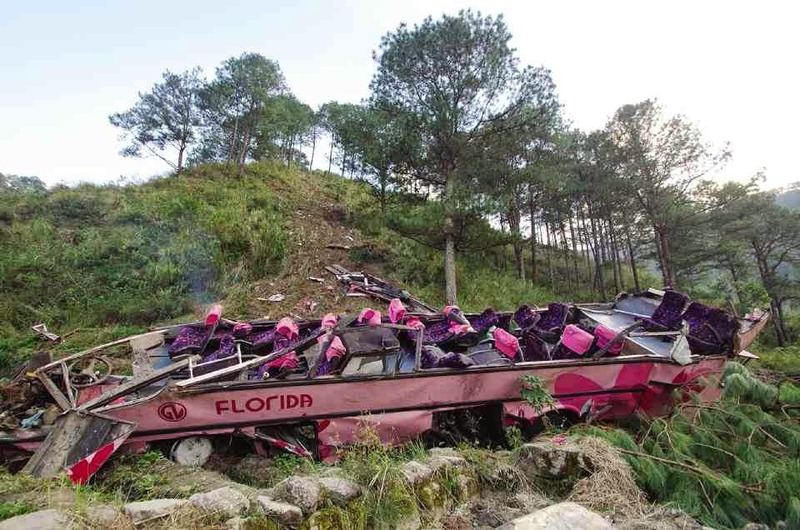 Florida Transport bus accident in Bontoc on February 7, 2014, it would always say, "the tragedy that killed local comedian Tado Jimenez and 14 other passengers." Those fourteen other victims' names may come up occasionally, but it is highly unlikely that they'll mention the survivors and those left behind by the casualties. Not how they're living right now or what they've lost. Not the traumatic memories that constantly invade their thoughts. Certainly not the tears that they still cry. At least, not anymore. Let me make an attempt, albeit a feeble one, at shedding some light on that through the stories of two friends who were in that accident, Cams and Ayen. What became of the bus after it fell off the ravine in the path through Bontoc that it allegedly wasn't even supposed to take. Photo courtesy of Inquirer News. I met Cams Osorio as a phone banker at Citibank three years ago. We became close after the friend who got me into the company, Maricris, resigned from her post. Cams' middle name is Lachica and though it suits her well ("chicka," in Filipino slang, means "gossip" or "stories," and Cams is a wellspring of stories), my friends and I have a running joke that it should have been Laronda (in Spanish, "rondar" means "to patrol" or "to go around"). She simply cannot be expected to stay in one place—if she does and you don't give her anything to do, she'll be sure to fall asleep. One weeknight in the office, a colleague clipped a pedometer to her belt and in just three hours she had walked 1,769 steps (there's a photo to prove it), which was almost a kilometer and a half...and she hadn't even left the building yet. Cams has an adventurous spirit and she was the one who to my eternal gratitude introduced me to mountaineering. Our most memorable climb was up Mt. Apo last year, where I met two of the casualties of the Bontoc bus tragedy, Gerard Baja and David Sicam, and survivors Paeng Gordovez, Charley Sta. Maria, and David's son Agung. Cams also introduced the world of theater to me, through her college friend—and now also a good friend of mine—Claire, who used to work for Atlantis Productions. Now, because of the accident which had broken some of the bones in her right arm and both legs, she has had to endure a life with steel implants in her bones, in either bed or wheelchair, with occasional flashbacks and nightmares of (and sometimes triggered by) ambulance sirens, chopper noises and the cacophony of people panicking and crying, wheels grinding on bumpy ground, and the bus flying off the cliff, rolling, and then finally crashing. Imagine the torture that could do to someone. Physically because of the pain. Mentally because of the traumatic memory continually replaying in their head. And emotionally, especially to a restless soul such as Cams who can't go hiking anytime in the near future or watch a musical at the theater, not to mention roam our office's carpeted hallways to socialize with almost everyone in our 400-employee strong department. Abigail Sicam, or Ayen to her work friends, was the wife of the late David Sicam and the mother of two bright and beautiful boys, Agung Dayaw and Amian Dayig, ages 7 and 4. I was never close to Ayen but having been with her in Davao before and after our Mt. Apo hike and knowing her reputation at work were more than enough for me to know the type of woman she is. She's smart, efficient and caring, and if I were to judge her based on the manner in which her kids conduct themselves, I'd say she's a gentle, loving and principled mother. She may be mild-mannered but I see an all-consuming fire in her that can flare up should anyone try to hurt those that matter to her most. That same fire did flare up that tragic day in February, causing her to put herself in harm's way to protect her children. She and David wrapped themselves around Agung and Amian, a final act of love for David during which, Ayen had said before, he had gazed at her with a look on his face as if he had known this would happen all along and he had made peace with it. "I love you," he had mouthed to her. A day later, Ayen would wake up in the ICU of St. Luke's Hospital, Quezon City, for the first time able to take everything in but never inquiring about her husband's condition. She must have already known for certain, everyone agreed, that David had gone. That, of course, didn't mean she had already accepted it. A month ago, our department head Sylvia brought me and one of our bosses JP with her to see Cams and Ayen in their homes. 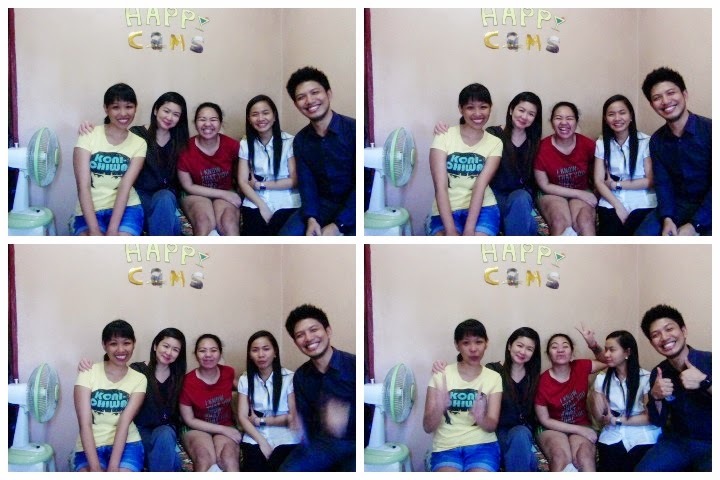 It was not my first time to visit Cams. She's staying in Pasig under the care of two nurses, one a private nurse and the other a colleague who also happens to be a nurse. Two physical therapists come to work on bringing her limbs back to optimal nerve and muscle function five times a week. G.V. Florida Transport, thank God, has been faithful in paying for all of her medical expenses and through their payments she had been bought a wheelchair. The apartment unit she's temporarily living in, however, is on the third floor and the building's hallways and stairs are narrow and steep so she really can't go anywhere. Still, with barely nothing but the television, her mobile phone and a Wifi connection to keep her occupied, she doesn't let her situation get her down. She was as cheerful as ever when we came to see her. She joked and laughed and even initiated taking a photo with us and Claire who was also there that afternoon. After the final operation on Cams, which was a bone graft last Wednesday, she's expected to regain the ability to walk in September this year, and hopefully she can also immediately get back to work. She'll be prohibited from taking dangerous hikes, which is understandable. No more mountaineering, probably not even minor hikes or trips up north by land. We both know her wanderlust is unquenchable because we're kindred spirits and I have the same, but in the meantime she'll have to abide by medical and parental advice. It's going to take all her energy to keep herself from hopping on a bus to get on her next adventure, as I'm sure it does now, but as a good daughter, friend and colleague, that's what everyone would like to see her do. Ayen is staying at their Project 4 house, which is thankfully a bungalow, with her mother, sister, sons and a full-time private nurse. 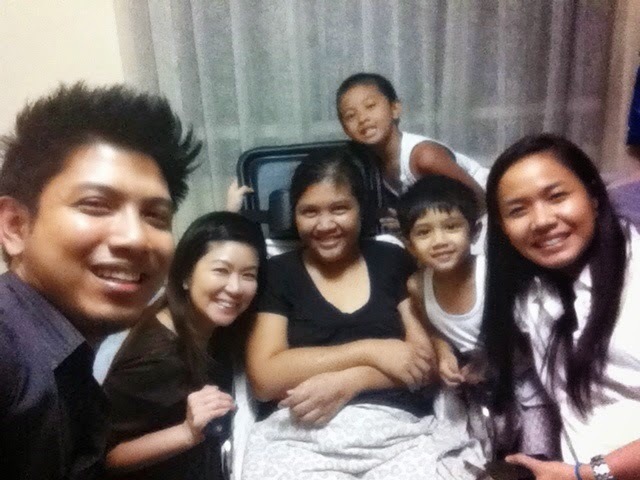 She was in a wheelchair beside her home-care hospital bed when we came to visit her. She has had three operations, because her injuries involved her head and spine, but in spite of that she's expected to be able to return to work in August, earlier than Cams because the damage to her limbs wasn't as severe. Ayen was not in the same jovial mood as Cams was, however. Aside from her former physical state, she had lost a husband, after all. I didn't dare ask Ayen how she was feeling or what she was thinking. I didn't even dare tell her she had my sympathies. Probably the only proper thing to say was I couldn't imagine what she was going through, but I didn't say that either. I just sat facing her, trying but failing to hold back my tears, as she told us that despite David visiting her in her dreams to comfort her, she still hadn't "cried 100%" to that day. I believe that depending on the situation, there's a certain amount of tears that one must shed in order to be truly okay. I cried buckets during my first break-up almost four years ago and in hindsight I don't think it was even worth all those tears. David definitely deserves Ayen's and if she's yet to "cry 100%" over his passing, I could only imagine how many buckets of tears that act would entail. In the room where we were, on the queen-size bed that used to be Ayen and David's, Agung and Amian were playing with the colored pipes meant for Ayen's hand exercises, connecting the plastic pieces together to form makeshift guns. Agung came out of the accident with a fractured wrist and several lacerations on his head that required ten stitches, while Amian was unscathed. Still, despite Agung's minor injuries which had already healed, there's the mental trauma to consider for both of them. Most boys their age, let's admit, are impossibly rowdy, but these two are decorous even in their playfulness, a testament to how well their parents had raised them. Back on the day of the accident, while I along with everyone in the office who knew Cams and Ayen awaited every bit of news about them, I couldn't help but be brought to tears whenever I thought of how Ayen's boys will remember that day in the future, especially Amian whose birthday was the entire reason their family and David's group of friends tried to go up to Kalinga in the first place. Will he wrongly blame himself for being the indirect cause of his father's death? I know I still sometimes wonder how if I had come along with Cams she might have suffered less injuries than she did. I shudder to think Amian might think something in the same vein one day. Looking at Agung and Amian during our visit, as they jumped around in bed, played with toy cars and those pipes and asked us to guess at crayon drawings, you wouldn't think they had just lost their dad. Agung, who is older, may seem somber at times, probably because he has more understanding of these things at his age, but you couldn't find a trace of sorrow in Amian's perpetually smiling eyes. I could only wish that this meant David, with his adventurous nature and exposing his children early to the outdoors, had taught them about courage just enough for them to be able to weather this mournful stage in their lives. Our drive back to the office brought us past the peace-themed mural that David helped complete on the exterior walls of Camp Aguinaldo, the AFP headquarters in Quezon City. Recalling the strength with which those he had left behind are carrying on, how his life was at that moment still being well-celebrated and how the reason he had brought his family and some friends up north three months ago was so he could impart the importance of our Filipino culture to his sons, I decided David, young as he was at 35, had died an honorable death. And I hoped Ayen would find comfort in that. Yesterday marked the fourth month anniversary of the terrible accident. To commemorate it, friends and relatives of the casualties along with some survivors themselves organized a street art painting event called Biyaheng Pagbabago in front of the G.V. Florida bus station along M. Earnshaw St., Sampaloc, Manila. The paintings are a slap in the face for the people of the bus company, constantly reminding them of the lives they indirectly put to an end and the others they have made to suffer. But more importantly, those ironically joyful smiles, more than the painted text, are a reminder to everyone to continue dreaming dreams that not even a negligent driver, a greedy bus company or, to look at things at a larger scale, a corrupt political system could snuff out. 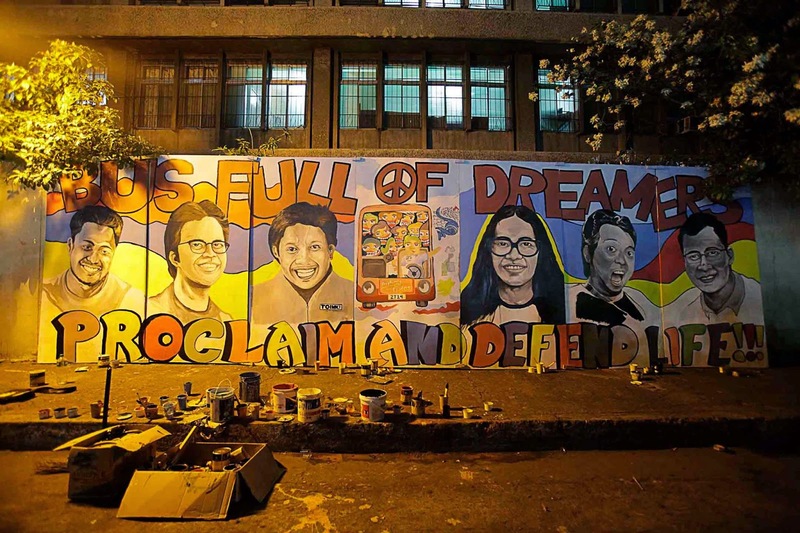 The faces in the paintings, from left to right: Giovanni "Bam" Morillo, Gerard Baja, David Sicam, Arvin "Tado" Jimenez, Christian "Mylo" Cabardo and Marcial "Don" Baranda, Jr. Photo taken by LJ Pasion. UPDATE: I just found out that 3 days after they were created, the paintings are nowhere to be found. I wish it had gotten more media coverage, but at least the message had been sent.